Both the variants spotted get similar twin projector headlamp setup. Top variant offers a healthy dose of chrome outside; lower variant has silver finished elements. Low-spec variant gets silver alloys compared to machine finished dual-tone alloy wheels on the top-spec. MG Hector will launch in June 2019. Ahead of the Hector’s launch in June 2019, two variants of the MG (Morris Garages) mid-size SUV have recently been spotted together. The differences between the two give us an idea, as to what MG will offer on lower variants of the Hector. The lower-spec Hector that has been spotted has a grey paint job, while the higher-spec SUV gets a deep purple shade. Comparing the two, the low-spec variant gets silver appliques on the front fascia, around the grille and headlamps housing, whereas the top-spec model features a healthy dose of chrome, adding to the sense of premiumness. The grille is otherwise similar on both variants. 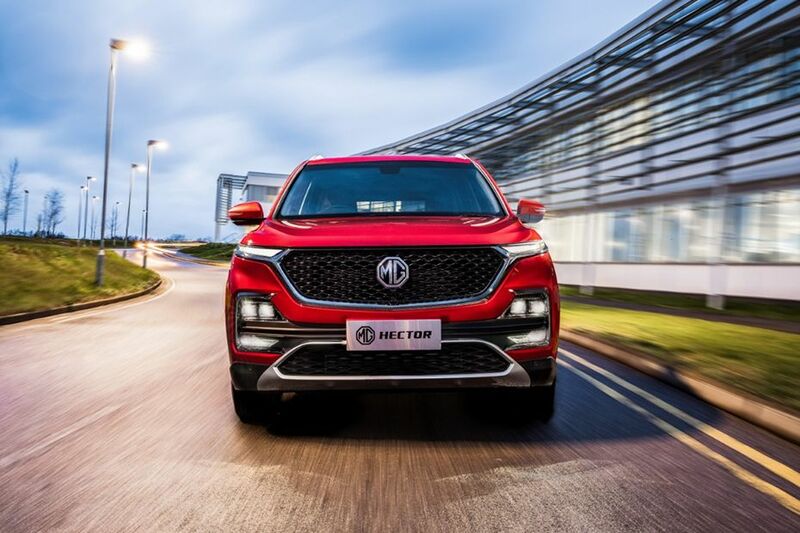 The headlamps on both the variants look identical leading us to believe that MG will offer the lower-spec variant with a dual projector setup, probably lit by LEDs, same as the top-spec variant. The DRLs and fog lamps are also offered in the lower-spec variant. It also gets five-spoke silver finish alloy wheels which have a clean design, whereas the top-spec variant gets flamboyant multi-spoke machine finished dual-tone wheels. Carmakers these days offer their premium vehicles in limited variants and there are chances that MG might also limit the Hector’s variant line-up to two or three variants only. Apart from the two cars spotted recently, a Hector without alloy wheels but with DRLs was spotted previously. Only time will tell whether the Hector will come in two variants or three, but looking at the spied images, it does appear that none of the variants will look basic. The MG SUV will be powered by a 1.5-litre turbocharged petrol engine and a 2.0-litre diesel engine. The petrol engine will get a dual-clutch automatic option and there will be a 48V mild hybrid system as well. Hector will be launched in June 2019 and will primarily rival the Tata Harrier, Mahindra XUV500 and the Jeep Compass. Hyundai Creta’s higher variants are also expected to overlap with some of the lower variants of the MG SUV. Are you looking forward to the launch of Hector? Let us know in the comments below and stay tuned to CarDekho for more updates on the same.